Xavi Hernandez played his last league game for Barcelona today, ending a career with the club that started in 1991, when he was 11 years old. He made his debut for the first team in 1998, but it would take a decade for the diminutive playmaker – in my mind the most influential midfielder of the past ten years – to make his mark on the team, and in fact all of world football. Xavi’s rise to prominence began in the summer of 2008, when Spain manager Luis Aragones built the national team to take advantage of the central midfielder’s gifts of ball possession and retention. 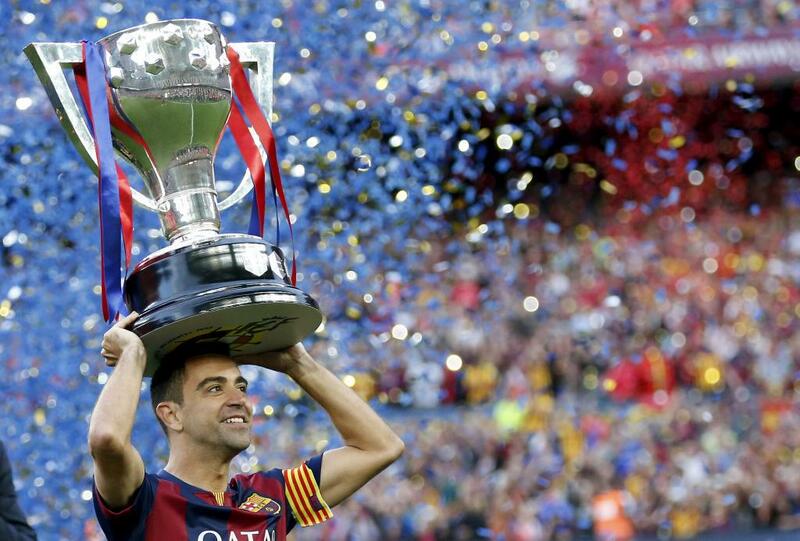 Spain tiki-taka’d their way to a European championship, with Xavi earning player of the tournament honors. Xavi came back to Barcelona on a high, and took control of new manager Pep Guardiola’s offense, amassing a trophy haul from 2008-2012 that would rival most clubs’. In fact, Xavi Hernandez’s club and country trophy haul in that four year period is more than Real Madrid, Bayern Munich and Manchester United combined. His 17 trophies, in fact, are more than Arsenal’s entire Premier League haul (15) and Chelsea’s since 2004 (13). For a long time, Xavi was the symbol of Barcelona football, the engine that made everyone tick. And while he’d be quick to tell you he’s not even the best midfielder on the team (that would be his best friend Andres Iniesta), it was he that ran the show. The team was built to accommodate Lionel Messi’s talents, but it was built around number six. As time went on, and the immortal makina showed signs of mortality, Xavi accepted a new role, one that allowed him to be great for a shorter period of time rather than good for a long time. He became Luis Enrique’s closer this season, the guy you call upon to shut a game down. And while most teams do it by adding defensive mettle, Xavi did it by lulling you to boredom, with short, deliberate passes around the field. Quietly, the machine just kept on humming. Xavi’s last La Liga game was against Deportivo La Coruña, a drab contest that ended in a 2-2 draw. But the game, a mere formality after Barcelona already clinched the title last week at the Calderon, was the undercard. Today, everyone came to say goodbye to Xavi Hernandez, the soul of the Barcelona machine. This entry was posted in La Liga and tagged barcelona, Xavi. Bookmark the permalink.